A Frugal Family's Journey: We Just Joined the 600K Club!! We Just Joined the 600K Club!! We started blogging about our frugal family's journey roughly 44 months ago, on March 15, 2014. Our blogging journey started out as a hobby and simply a way to keep on track of our progress. Flash forward 3 years and roughly 8 months later, I am thrilled to announce that because of each and every one of our readers, we just reached yet another milestone. Within this past week, our blog crossed over the 600K mark! Although we have not been active for a few months, its humbling to see the page views have not completely stopped. And for that, we thank each and every one of your for your loyalty and support. It took approximately 15 months to reach our first milestone of 100,000 page visits to our blog. 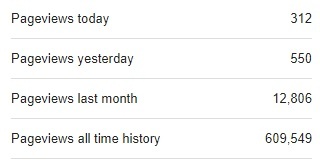 The second milestone of 200,000 page visits took 6 months and 28 days. The third milestone of 300,000 page visits, even with a 6-week hiatus last summer, took us 7 months. With newfound drive, we reach our fourth milestone of 400,00 page visits in just 4 months and 22 days. Continuing that incredible pace and traffic, it took us just 3 months and 17 days to reach our fifth milestone of 500,000 page visits! And thanks to all of you, we recently reach yet another milestone! I'm happy and blessed to say that we reached the 600,000 page milestone this past week. This last milestone, with yet another hiatus this past summer, took us roughly 5 months and 20 days. Since I am somewhat of a stats nerd, below are some additional stats behind our 500,000 visits. 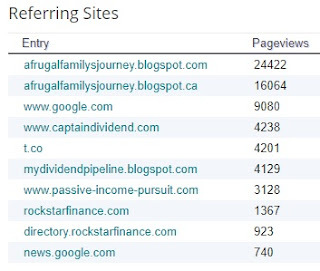 Google searches and internal cross links within our posts play a vital role in our blog traffic. But we also want to recognize and give special thanks to our twitter followers, as well as Captain Dividend, My Dividend Pipeline, Passive Income Pursuit, and Rockstar Finance for the traffic from your respective blogs. 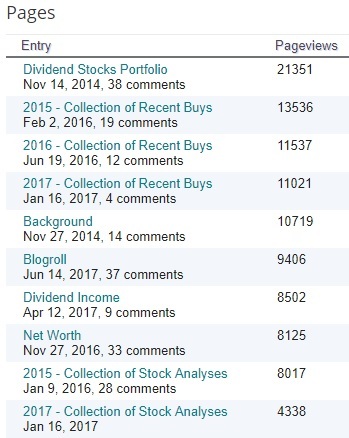 Lastly, although not present on the list above, I would like to also thank two other fellow blogger and friend, Roadmap2Retire for your continue support and mention of our Collection of Recent Buys and Collection of Stock Analyses. Also, thanks to all that have tweeted or re-tweeted our posts. Our additional presence and our followers on Twitter continues to help get our blog grow. In case you would like to follow us on Twitter, we can be found under: @FrugalFamilyof4. I'm proud to say that we currently have 1,773 followers on Twitter. That is 107 new followers since our last milestone post on May 20th. 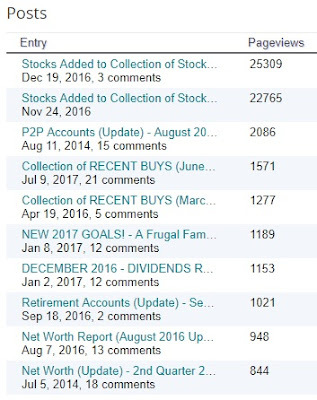 Our top three most popular page visits are: 1) Dividend Stocks Portfolio with 21,351 page views; 2) 2015 - Collection of Recent Buys with 13,536 page views; and 3) 2016 - Collection of Recent Buys with 11,537 page views. 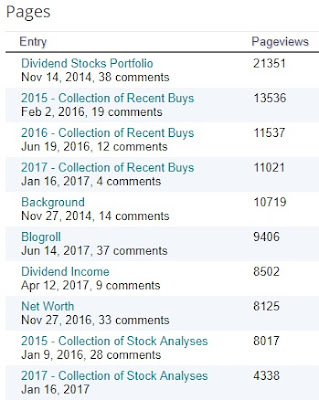 It is great to see that our readers are utilizing our free reference tools. Our top three most popular posts are: 1) Stocks Added to Collection of Stock Analyses - December 2016 with 25,309 page views; 2) Stocks Added to Collection of Stock Analyses - November 2016 with 22,765 page views; and 3) P2P Accounts (Update) - August 2014 with 2,086 page views. We are tremendously grateful that our blog has seemed to have a worldwide presence as evident by the chart above. 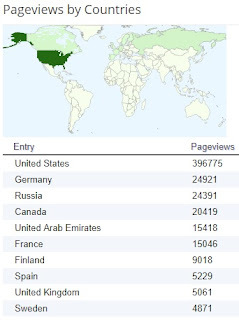 However, the top page views to our blog came from the following top four countries: 1) United States, with the largest presence at 396,775 page views; 2) Germany is now in second with 24,921 page views; 3) Russia fell from second to third with 24,391 page views; and 4) Canada rounds out the top for with 20,419 page views. These top four countries has consistently remained our top readers but it appears that the United Arab Emirates and France is slowly gaining ground on the top four! Congratulations : ) Always was fun coming to the blog! Awesome AFFJ. The amount of growth the site has enjoyed is just awe inspiring, especially for those of us who are bloggers on a smaller scale. Truly impressive and congrats. I love stats ,its good to see you reach 600k,remember reading the 500k earlier. Congrats on the 600K mark. Congrats! Nice milestone! Keep it going. Congratulations! Those are really impressive stats! AFFJ - Taking a break from blogging.